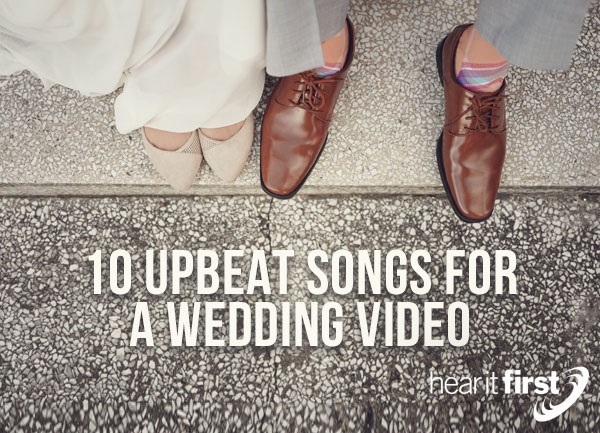 Here are ten great upbeat songs you can use for a wedding video. Almost everyone should recognize this song as well as the hall of fame artist, Frank Sinatra. One of the most frequent subjects Sinatra ever sang about was…you guessed it…love! This song is so full of energy that I believe it will get everyone in the mood to dance and celebrate the joyous occasion of a couple getting married and would make for a great song for a wedding video. The words are passionate, stirring, and completely appropriate as he sings, “Fill my heart with song and let me sing for ever more. You are all I long for….in other words, I love you.” This song is sure to be a hit in any wedding video and is appropriate for all ages. I remember this song making a big impact in the huge romantic movie, Sleepless in Seattle. This is a very contemporary and upbeat song that would make a great addition for a wedding video. Even though we all know, love is not easy, they make it sound that way, and besides, a wedding day is supposed to be positive and uplifting and this song fills the bill. Just listen to how joyful these words are as they sing, “If this is love. Then love is easy. It's the easiest thing to do. If this is love. Then love completes me.” This song repeats the word “love” over 30 times and would be perfect for a wedding video. Besides, if you’ve seen the video of this song, you’ll be sure to be swept up too at the wedding party. Tony Bennett’s The Best is Yet to Come, seems to be written just for a wedding as the words are perfect for such a setting. It’s an upbeat and uplifting song that encourages the couple that, “The best is yet to come, come the day you're mine. Come the day you're mine. I'm gonna teach you to fly. We've only tasted the wine. We're gonna drain the cup dry.” There is a great duet performance that would be perfect for a Latino wedding where Tony Bennett is accompanied by Chayanne who repeats the song’s lyrics in Spanish. What a great song for a wedding video. This is one of the most popular wedding songs of late in recent years. Coldplay’s song, A Sky Full of Stars, has a mid-to-fast tempo and is certainly energetic enough to keep everyone moving and maybe why this song has been so popular lately. The words are perfectly suited to a wedding with lyrics like “I wanna die in your arms. Cause you get lighter the more it gets dark. I'm gonna give you my heart…, 'cause you're a sky full of stars” and “Because you're a sky, you're a sky full of stars. Such a heavenly view. You're such a heavenly view.” This song is fast-paced but also silky smooth and almost seamlessly moves from one line to the next and would make a great addition for any wedding video. Shut up and Dance by Walk the Moon is perfectly suited for any wedding video, especially those who want an upbeat wedding song that gets everyone in the mood to dance. This one qualifies in all respects. The fast beat is guaranteed to knock the wallflowers off the wall on spill them onto the dance floor. It would also make a great wedding video with a photo gallery display while the song plays in the background. It’s also perfect for the wedding dance at the reception with lyrics like, “I felt it in my chest as she looked at me. I knew we were bound to be together. Bound to be together” and that is just what a wedding portrays…being bound together…forever! The song, I Want You to Know, by Zedd and featuring Selena Gomez, is one fastest movers in this list, and it’ll help get the wedding guests pumped up about this very special day and would make the perfect song for any wedding reception. The lyrics include, “I want you to know that it's our time. You and me bleed the same light. I want you to know that I'm all yours. You and me we're the same force. You and me run the same course.” With lyrics like these, it makes for a perfect song for a wedding video. Frank Sinatra’s rendition of I Get a Kick Out of You is one of the best from “old blue eyes.” This song is focused on the bride, but it’s totally upbeat, and the older wedding guests may want to dance this one because it’s the perfect blend of horns, drums, and the perfect pitch of Frank Sinatra, so it makes it nearly impossible to stay in your seat. This song could make for a “swingin’ time” at any wedding dance and is perfect for any wedding video because of its timeless elements and relevant words. Canaan Smith’s song, Love You Like That is a mid-tempo song with an upbeat message. It’s been one of the most popular wedding songs of late because of its contemporary style, and even though it’s close to what many consider a from-the-heart country ballad, the message is perfect for a wedded couple with lyrics like, “Deeper than a sunset sky. Sweeter than muscadine wine. All night 'til the sun comes back. I wanna love, wanna love, wanna love you like that.” What a great song for a wedding video too. This is contemporary song that would be very suitable for a young couple as they sing, “got this feeling that you can't fight. Like this city is on fire tonight. This could really be a good life. A good, good life” as “This could really be a good life, good life.” If you are engaged to be married, I urge you to check out this video and the lyrics. It could be a great addition to a wedding reception dance or to make a wedding video out of. If you or someone you know is engaged to be married and is preparing for a wedding, please forward this to them so that they or you can find an upbeat song for their or your wedding video that will be a timeless treasure for the rest of their lives together in wedded bliss. A wedding is a very special occasion and these songs would add so much to a wedding party, a reception, or a wedding video and make a wedding even more special.